Yup. It's that time of year where we start thinking that we really shouldn't have had that extra slice of cake, that additional helping of lasagna or stuffed ourselves during the Holidays. But then again, it may have well been worth it. But for those of you who DO have that guilty conscience, this post is right up your alley. For those of you who are lucky enough to have a high metabolism, try these recipes just because they are delicious, great for you and simply a great side to anything you have grilling this summer. A light meal that fits that "feel-good" category of recipes. And as for the Apple Vinaigrette? Let's just say this will be the last vinaigrette recipe you will make. Beautifully tart and reminiscent of that ol' Yankee charm, it is a keeper. Begin by adding apple juice, water, vinegar, honey and lemon juice to the bowl of a food processor or blender. Pulse on high for 10 seconds and keep it running. Slowly add the olive oil to the dressing until all ingredients are emulsified well; set aside. Get 1 quart of water boiling over high heat. Gently add the bean sprouts and boil, stirring once, for 2 minutes. Strain well and transfer to a bowl; let cool to room temperature. When ready to serve, toss with garlic, chili powder, corn, apple, water chestnuts and Apple Vinaigrette Dressing. This is one recipe you will eat all by itself. Loaded with protein, without added fat, it is one of those feel good meals. For an even higher boost of protein, without fat, add some cubed tofu. For those of you who want a little "meat with your potatoes", so to speak. add some chicken or beef cut up small while sautéing onions and garlic. Whisk together vegetable broth, soy sauce, vinegar, brown sugar and sesame oil in a bowl; set aside. In a large skillet, over medium-high heat, add canola oil until it is shimmering hot. Add the onions and garlic and stir-fry for 1-2 minutes, or just until the garlic is becoming fragrant. Add mushrooms and lima beans. Stir fry for 4-5 minutes, or until the mushrooms are tender. Add broth mixture and bring to a boil. 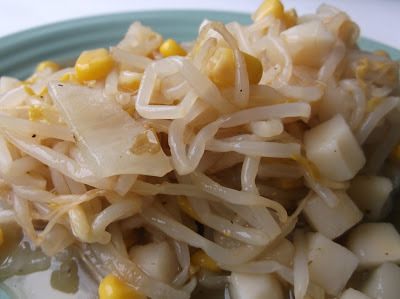 Stir in the bean sprouts and continue cooking and stirring for 2 additional minutes. Remove from heat to serve immediately. Every once in a while, I make breakfast for lunch or supper, never giving any thought to an alternative that is considered both in the 'other East'. 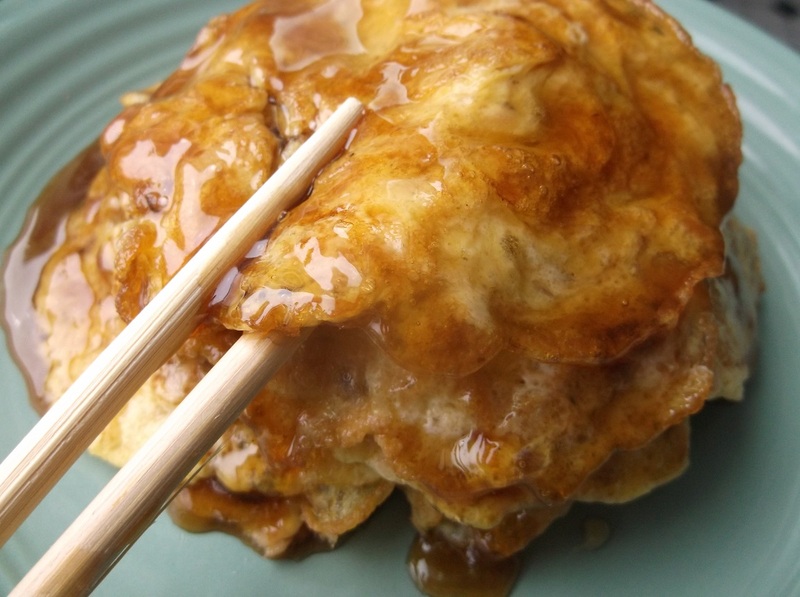 Asian-style omelets are eaten throughout the day and after a few bites, you will see why. Heat 1 tablespoon oil in a small skillet. Add celery and onions, cooking until the celery is softened, about 3 minutes, stirring occasionally. Add the mushrooms and cook until soft, about another minute. Remove from heat, drain and set aside. In a small saucepan, whisk together broth, cornstarch, sugar and soy sauce and cook over medium heat until it boils and thickens, about 4-6 minutes. Set aside, covered, to keep warm. 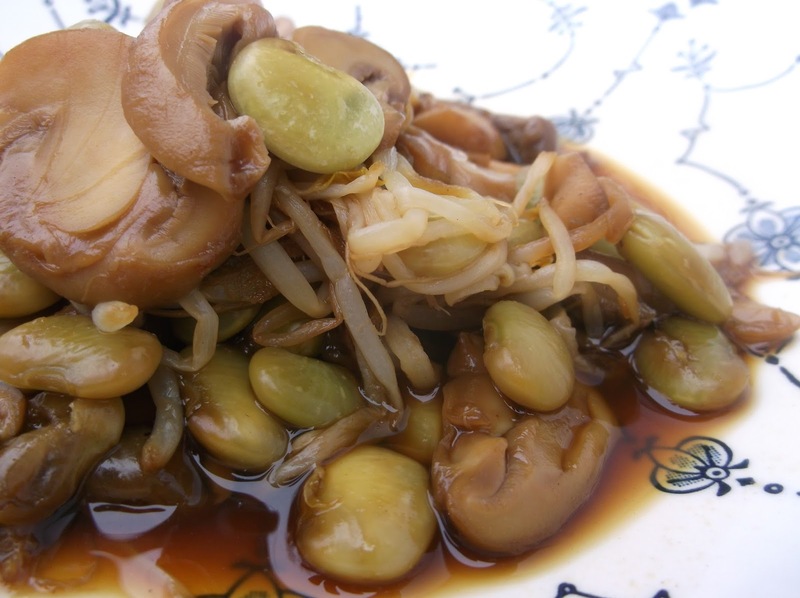 In a large bowl, stir together eggs, spices, bean sprouts, shrimp, celery and mushrooms. Add a half tablespoon oil to a skillet over medium heat until hot. Pour in 1/4-1/2-cup measures of omelet batter to skillet and cook until browned on both sides, about 2-3 minutes per side. Transfer to plate and continue until all omelets have been made. Pour soy mixture over the top and serve immediately. Well, maybe not completely unique but delicious none-the-less. 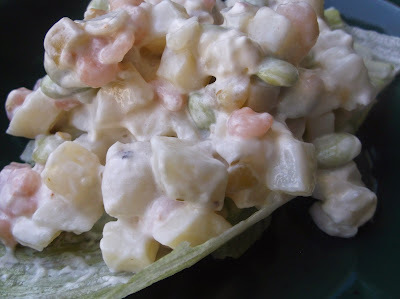 I think you will find that each of these summertime salads will find a spot on any picnic table you sit at this year. These recipes are enough for 4 side dishes but if your family is anywhere near as large as mine, a 5-pound bag of potatoes may just be enough. So multiply everything accordingly. For the BBQ chicken recipe, it is following these salads below. Hot House usually refers to an enclosed space for growing vegetables, mainly cucumbers to name one, quicker here in New England. 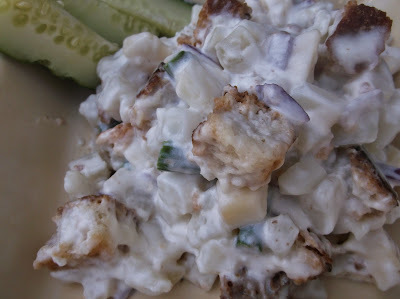 The use of the term here denotes the addition of cucumbers but also with the slightly fiery taste introduced into this "good for you" summertime fare. The texture is there, the taste is there and above all, you will get up feeling better about going for seconds or thirds. Boil whole potatoes and diced carrot in enough water to cover by 3 inches until potatoes are tender. The carrots may be still firm, but that is what we are looking for. Strain and cool. Dice potatoes into a bowl with the carrots and cool completely. Add the next 7 ingredients, tossing well. In a small skillet, coat the bottom with nonstick cooking spray and place over medium heat. When hot, add the egg white and cook for about 30 seconds, or until just done but not browned. Flip and cook an additional 15 seconds. Remove to cool. Roll up cooked whites and slice to form ribbons. Top your potato salad with whites and chill at least 1 hour before serving. Bet you never thought of adding croutons to potato salad before, have you? I can also make another assumption that you may not make it again without them. A great crunch and an even greater potato salad awaits you. Bake potatoes with the skin on until done but firm, about 35-40 minutes on 375-degrees F. Remove and cool completely before peeling and dicing. Cut green beans into 3/4-inch slices and add to a large bowl with all ingredients. Toss well, cover and refrigerate until ready to serve with cucumber wedges . This is the perfect summertime salad to have at any lobster bake, crab fest or simply a get together. Make sure you keep it well chilled although, but I don't think you are going to have to worry about any leftovers. Coat a skillet with nonstick cooking spray and place over medium heat. Pat the shrimp dry and place in skillet to cook completely, about 3-4 minutes. Remove, drain and set aside to cool. In a large bowl, combine remaining ingredients except lettuce leaves, add the cooked shrimp and toss well. Chill at least one hour before serving on lettuce leaves. 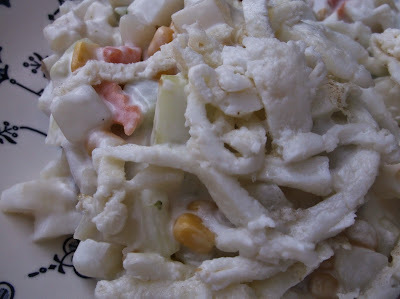 *I used salad shrimp(baby shrimp) but you can use larger shrimp that you have peeled, cooked, and chopped if desired. Oh what to heck. Here is a great barbecue recipe to enjoy with the salads above. This is what I call picnic chicken! You know the kind...dripping with glaze and so sticky the only way to clean up after yourself is with a wet washcloth. Heck, it would take a dozen wet naps to clean your hands alone. 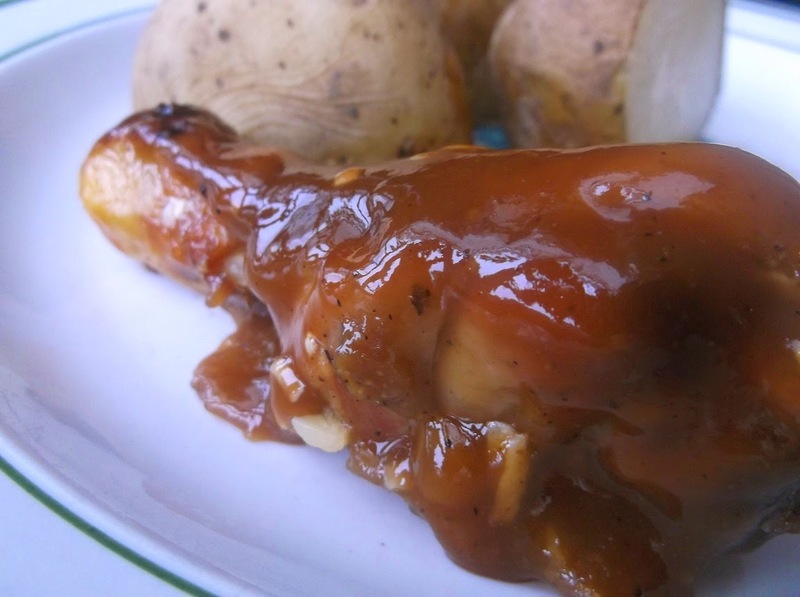 So get out the potato salad or simple, plain baked potatoes and lemonade and dig in to this ultimate glazed chicken. In a bowl, blend brown sugar, salt, garlic powder, black pepper and chili powder well. Season each chicken leg well, rubbing it all over. Cover and let sit for at least 2 hours. When ready, fire up only one side of your barbecue grill to about 300-degrees F or preheat oven to 350-degrees F. Put the chicken drums on the side of the grill that has no heat. Close lid and cook about 35-45 minutes, or until juices run clear or the chicken has reached about 175-degrees F.
If using an oven, layer some tin foil over a baking sheet and bake chicken for 30-35 minutes. While chicken is cooking, make glaze by whisking marmalade, molasses, soy and mustard together well in a bowl. When chicken is cooked through, remove from grill, dip each in the glaze and place back on the grates to cook an additional 6-8 minutes, or until the sauce has caramelized. If baking, brush glaze over chicken and continue cooking the same allotted time. No idea why I named this post a Meatball Picnic but it just seemed a natural. 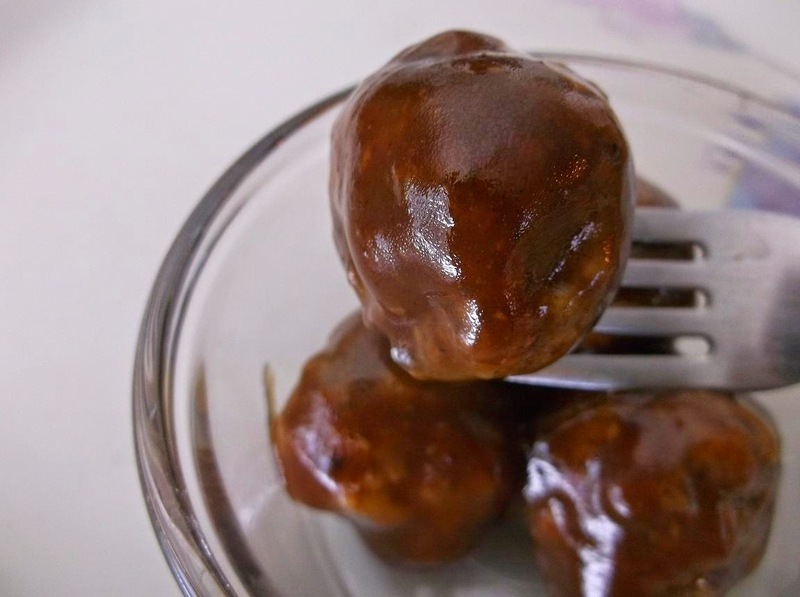 I have never had meatballs at a picnic but it doesn't take much imagination to picture myself(or anyone else actually)sitting down at a picnic table and chowing on these. Add some coleslaw, potato salad(which will be my next post by the way)and I am a happy camper. Just thinking about a friend of mine whose name is Jim as well. He is tossing back a few cold ones right now at a local campground and looks as though he may be there for a while yet. Hey JIM!!! Make some meatballs, will ya? What a way to start the summer! The sweet taste of New England in every luscious bite of these glazed meatballs would be a perfect accompaniment strung on bamboo skewers and served alongside you favorite potato salads and of course, a cold bottle of hard apple cider. 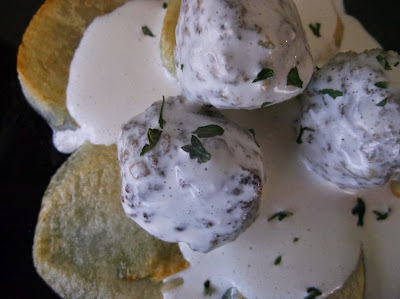 In a large bowl, combine all meatballs ingredients well and form into balls about an inch and a hla in diameter(or larger if you prefer). Place in a large skillet with oil and start browning over medium heat. Toss them around so that all sides are browned. Reduce heat to low, cover and gently cook until well done throughout, tossing occasionally. Meanwhile, make sauce. Combine all ingredients in a saucepan, whisk well and bring to a boil over medium heat. Reduce to low and simmer for 15 minutes, or until reduced slightly and thickened. Add the meatballs to the sauce, stir to evenly coat and serve immediately. You may also drain grease from meatballs and pour the glaze into skillet with meatballs. Gently simmer over low heat for 10 minutes before serving, gently stirring to lift the fonds from the bottom of the pan. .
Of course you can cook these meatballs in a skillet or in the oven, but why not try something out of the ordinary and delightfully 'outdoorsy"? These tropical inspired meatballs are perfectly complimented with smoking and when served with plain or fried rice of your choice, they will be a winner at any get-together. Add first 9 ingredients together in a large bowl and mix well. Form into desired sizes, with 1 1/2-inch diameter shown in image. Get your smoker ready or toss a cupful of hydrated wood chips in your grill, on top of your grey coals or use a foil pack, tightly sealed, to produce smoke. 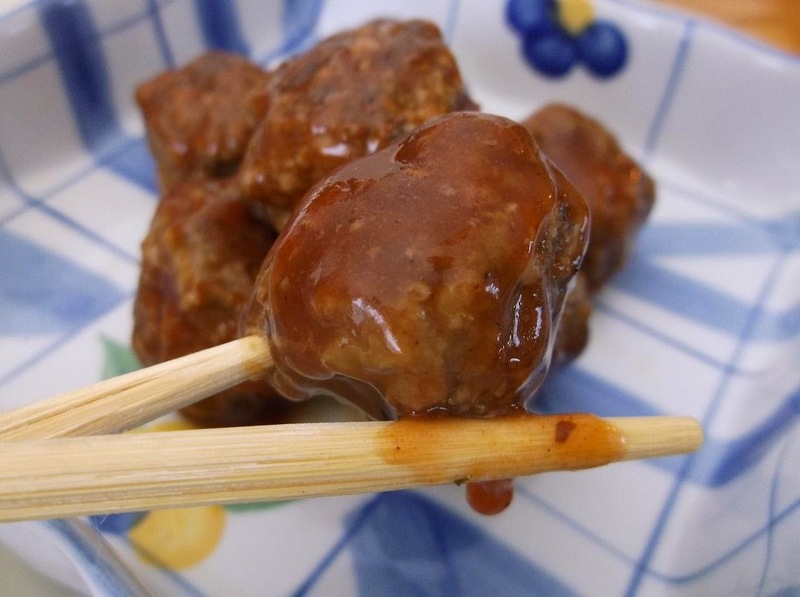 Place the meatballs in a foil pan and on grate in cooker or barbecue grill. make sure you have the lowest setting of heat if using propane and level out charcoal if using briquettes to plate wood chips. When smoking, close all vents and smoke meatballs for about 30 minutes, according to the size, or until well done throughout. Remove, douse with your teriyaki sauce and serve immediately. To make the Tropical Teriyaki Sauce, in a small bowl, mix 1/4 cup orange juice with cornstarch until smooth, making slurry; set aside. Place remainder orange juice, soy, brown sugar, garlic and ginger powder in a saucepan. Bring to boil over medium heat and whisk in cornstarch slurry until smooth. Reduce heat to low and simmer, stirring frequently, for 2 minus. Remove from heat and keep warm. Preheat oven to 350-degrees F. In a large bowl, combine the first 10 ingredients together and mix well. Form into 1 1/2-inch sized meatballs. 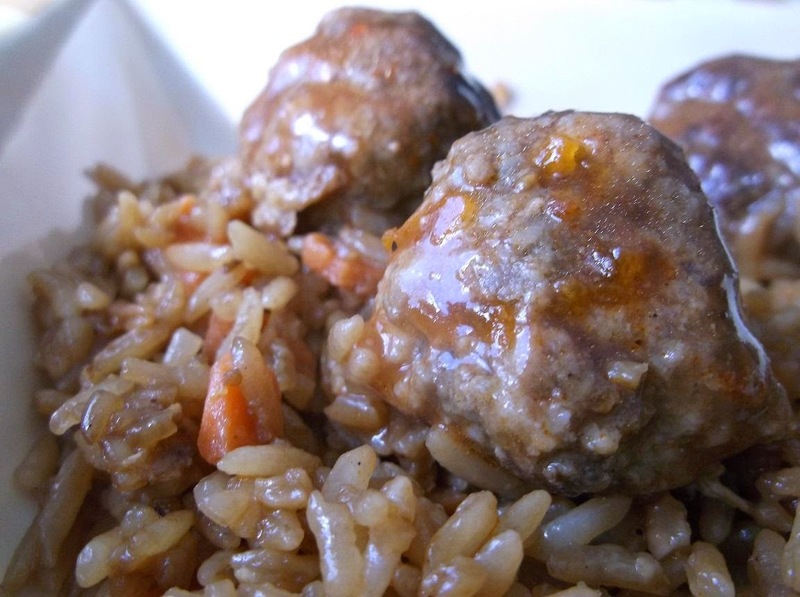 Place meatballs in a baking sheet with at least an inch-high sides. Bake 15-20 minutes, or until cooked throughout. Meanwhile, make White Gravy. In a large saucepan, add milk, Worcestershire sauce, black pepper and salt. Whisk well and bring to scalding over medium heat. Do not let it boil. In a small bowl, whisk together cornstarch with water to make slurry. When milk is scalding, reduce heat to low and whisk in cornstarch slurry until smooth. Remove meatballs from the oven and transfer to saucepan with a slotted spoon, gently coating each meatball with gravy. Keep warm while preparing potatoes. In a large skillet, melt butter over medium high heat. Add potato slices in a single layer. set aside any potatoes that don't fit right now. Cook potatoes until lightly browned on one side. If you have more potatoes to add, simply lift out cooked potatoes onto a plate while browning remainder. When potatoes are browned, after about 2-3 minutes, add chicken stock and reduce heat to medium. Cover and cook until tender but still firm. Remove cover and continue cooking potatoes, without mixing, another 3 minutes, or until most of the liquid has evaporated and the potatoes are done. To assemble, evenly divide potatoes, decoratively, in the center of each plate. Top with equal amounts of meatballs and sauce and serve hot. A little bit of everything to pique all areas of your taste buds. Pork meatballs are overlooked so often and without just cause, There is a reason why many Italian chefs add ground pork to meatballs, and this is a perfect example of a great tasting, saucy meatball. In a large skillet over medium heat, add oil until hot. Add garlic and cook 2 minutes, stirring frequently. Add onion and ham, stirring and continuing to cook until onions are softened. remove skillet from heat and transfer mixture to a large bowl with slotted spoon. Leave oil in skillet and set aside. Add remaining meatloaf ingredients and the bowl and mix thoroughly. Form into meatballs about an inch and a half in diameter(or larger if you prefer). Place them into the used skillet and start browning over medium heat. Toss them around so that all sides are browned. Reduce heat to low, cover and gently cook until well done throughout, tossing occasionally. Meanwhile, make sauce. Add chili sauce, chicken broth, cranberry sauce and vinegar to the bowl of a food processor or blender and puree until smooth. Transfer to a small saucepan with sugar and bring to a boil over medium heat, stirring occasionally. Reduce heat to low and simmer 10 minutes, stirring once or twice. Remove from heat. When meatballs are done, lift out with a slotted spoon into the sauce, toss to coat and serve hot. *Pour apple juice in the empty chili bottle, give it a good shake and pour into mixture.